Glass tile is a top trend in swimming pool design, since they offer a watery, iridescent look in a pool environment and are very stylish in appearance, as well as working well in cold climates as well as in warmer temperature, making it ideal for the extreme temperatures we’ve been experiencing in New Jersey. Glass tile creates a beautiful look for pool accents, and your swimming pool company will show you a wealth of glass tile styles, colors and sizes to help you custom-create the luxury styling of your pool environment. Establish a budget first. It’s important to establish your budget for swimming pool glass tiles, since the cost of your swimming pool design will need to include the amount you’ll spend on your glass pool tiles, and an organized budget (even a large budget) will help you make the best choices for your swimming pool plans. You’ll discover a wide variety of glass swimming pool tiles available on the market, in a wide price range, and arranging your budget at the start can help direct your search. Your swimming pool design company can point you toward the brands and styles of glass tiles for your swimming pool and spa. Make safety a high priority. Be sure to select glass tiles that are slip-resistant. As you know, your swimming pool area will be wet much of the time, while in use and also when it rains, and the safest choice for your pool area is a surface that provides good traction to prevent slipping and falls. 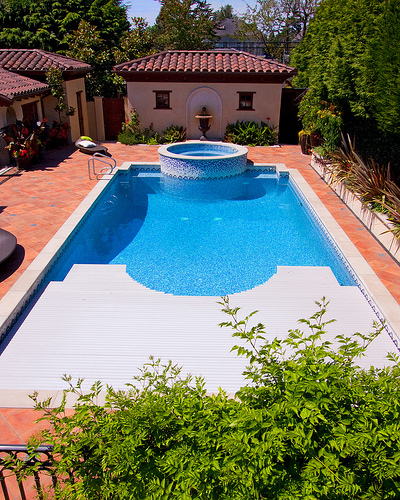 Tiles for use on the outside of the pool, such as on pool edges and where people will walk or stand, should be treated to increase their traction, making them slip-proof. Also, look for glass pool tiles that are frost-proof, to help prevent slipping on those colder days and nights. Look for tiles with a lifetime guarantee. Even before you look at swimming pool colors and styles, it’s best to think long-term for quality. Protect your swimming pool tile investment by looking for tile that comes with a lifetime guarantee against damage or fading, and increase the longevity of your swimming pool tiles by choosing waterproof tiles protected against UV rays that can fade them. Choose your favorite tile designs. Your swimming pool glass tile choices will of course depend upon your personal preferences, the colors and motifs that call to you or that suit your wish for a tropical swimming pool environment, a modern pool environment, a Mediterranean pool environment or any other style you desire. You might choose classic blue pool tiles for a traditional look, or you might opt for a neutral color scheme with lots of tan shades to complement the colors of your yard and landscaping. Green glass tile joins blue tiles as a top color trend for glass swimming pool tiles, and there is always the option of designing a mosaic artistry design for the bottom of your swimming pool. Keep in mind that since glass tile-lined walls extending out of the pool will be very much in view, the style, shape and colors of the tiles you choose will be fully on display. Your swimming pool design company can show you a range of complementary glass tile materials, styles and colors, from solid-colored tiles to decorative tiles in print patterns. Blue and white glass tiles reflect light well, and are great for deeper water because water depth can distort the color of the tiles. Avoid using dark-colored tiles for your pool floor, since the dark colors of tile can make it harder to judge how deep the water is. That can become a pool safety issue. Think about tactile elements. Rounded glass pool tiles are ideal for smoother comfort against the skin, set in places like pool edges or other spots where your guests will come into contact with them. Choose durable tiles. You’ll use different types of glass tiles for inside your pool and outside your pool. Wall tiles will likely be smoother than the tiles used on flooring, which will be made of a more slip-proof material. Talk to your swimming pool design company about the most recommended materials for your swimming pool’s different areas and uses. Ask about maintenance for your swimming pool tiles. Some types of glass swimming pool tiles are made of materials that should not come into contact with certain chemicals, so you’ll want to know all you can about what a particular pool tile’s limitations are for when you’ll need to clean glass tiles in the pool. Ask for glass pool tile samples. Before you order your swimming pool glass pool tiles, always ask for samples, so that you can take them to your pool environment and see them in your natural environment. Different colors of tiles may reflect the colors of your landscaping, your terrace, even the sky above, and the best and most realistic way to assess how your glass pool tiles will look is to bring actual samples to your yard and pool setting.